Last week, The Golden Globes announced their nominees, and it didn’t take us long to realize that no Latinas were nominated this year. Sigh. To be clear, we weren’t surprised but disappointed. After all, it was the 2015 Golden Globes that confused Gina Rodriguez for America Ferrera. 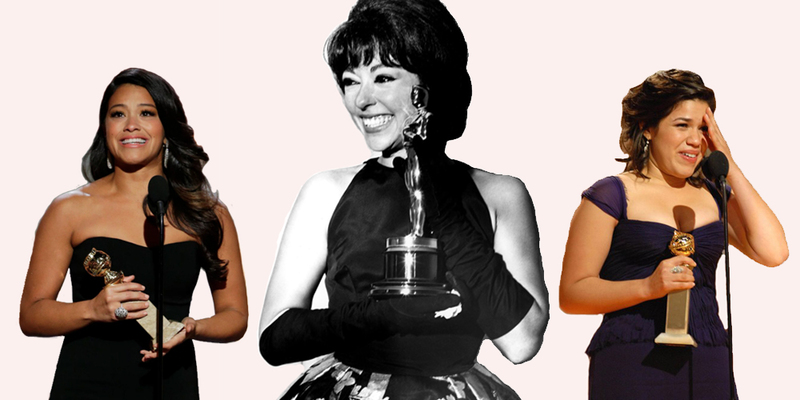 For the past 74 years, only 12 Latinos have won Golden Globes and out of the 12 only 3 have been women. There are countless Latinx actors, writers, directors, and screenwriters that have deserved to win awards (or at least a nomination). From the women of Vida, to Rita Moreno’s One Day at a Time, to the writers of Jane The Virgin, to Mj Rodriguez from the groundbreaking show Pose, we get passed over time and time again. It’s almost 2019 people! We should not be satisfied with just one film getting all the attention (although we are rooting for Roma to bring home some statues). You see no one film, TV show, character, or actor can represent something as dynamic as our community, the Latino community. Let’s be real – we purchase 23% percent of all movie ticket sales. We deserve to see ourselves at the highest levels in these award show, represented across the categories for all our meaningful, impressive work. There are over 55 million Latinos in the U.S. So why do we continue to be shut out of the national conversation? Join us and #WeAllGrow in calling for a change. Let’s #MakeLatinasVisible. P.S. Shout out to Sandra Oh who will be the first Asian Woman to host a major awards show! Because when women of color win, we all win #WomenofColorUnite!